Stuffies are popular on the south coasts of both Rhode Island and Massachusetts. This recipe is from Emeril's mom, Hilda, in Fall River. Although located in Massachusetts, Fall River is culturally Rhode Island. 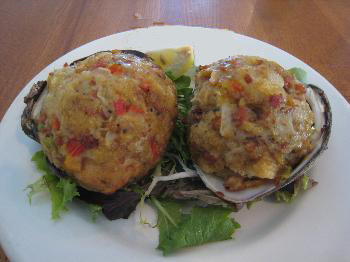 To me the best stuffed quahogs are made with some hot Portuguese chorizo. Preheat the oven to 400 degrees F, and bring a pot of salted water to a boil. Add the clams to the boiling water, cover, and cook for about 6 to 8 minutes or until the shells open. Discard any shells that do not open. Remove the clams from the pot and place on a parchment-lined sheet pan. When the clams are cool enough to handle, gently pry the shells apart enough to remove the clam, leaving the hinge attached. Loosen the muscle in the lower shell and remove the clam from the shell. Save the 6 nicest shells and place the shells on a parchment-lined baking sheet and set aside. Finely chop the clam meat and set aside. In a mixing bowl, stir the butter and 1 tablespoon of the garlic together. Season the butter with salt and pepper. Spoon the butter onto a piece of plastic wrap. Form the butter into a 1-inch log, cover tightly, and place in the refrigerator. Refrigerate for 1 hour. Heat a saute pan over medium-high heat. Add the chorizo and cook until rendered, about 2 minutes. Add the onions, celery and peppers. Season lightly with Essence. Cook for 2 more minutes. Stir in the remaining garlic, the breadcrumbs, and reserved clam meat and remove from the heat. Stir in the reserved cooking liquid and 2 tablespoons of the parsley. Season with Essence and cool slightly. Pack the stuffing mixture into one side of each shell. Slice the compound butter into 6 equal slices. Place a slice of the butter on top of each stuffing mixture. Using your hands, pat the stuffing firmly into each clam shell. Top each evenly with the cheese and the remaining parsley. Close the shells as tightly as possible and wrap with aluminum foil or tie the shell tightly with butchers twine. Bake for 15 to 20 minutes. Unwrap the clams and place on a serving platter. Garnish with additional parsley and Essence and serve hot. Heat oven to 275°. Pulse bread in food processor into fine crumbs. Transfer to a baking sheet and bake, tossing often, until dried, 15­20 minutes; set aside. Raise oven heat to 425°. Heat oil in a large skillet over medium heat. Add sausage, garlic, celery, onions, and peppers; cook until soft, 12­15 minutes. Add clams, clam juice, parsley, lemon juice, Tabasco, and worcestershire; bring to a boil. Reduce heat to medium-low; add butter. Add bread crumbs and salt and pepper to taste; stir. Divide stuffing between shells. Bake on a baking sheet until browned, 22­25 minutes. Sprinkle with paprika; serve with lemon wedges. Soak quahogs in cold water sprinkled with cornmeal, then scrub. Cook for 20 to 25 minutes, covered, with just enough water to cover bottom of large pan, until clams are steamed open. Strain and save liquid. Chop clams coarsely. Saute together in butter the onion, garlic, oregano, parsley, crushed red pepper, black pepper and Italian seasoning. Saute the Italian sausage and pepperoni. Soak Italian bread in 1 cup of clam juice. Mix with 2 eggs and seasoned bread crumbs. Add clams. Spray the shells with Pam and stuff them. Sprinkle with paprika - wrap each in foil. Bake one hour at 350 degrees. They freeze well. Source: The Providence Journal projo.com Recipes for a Rhode Island summer "Spicy Stuffies"